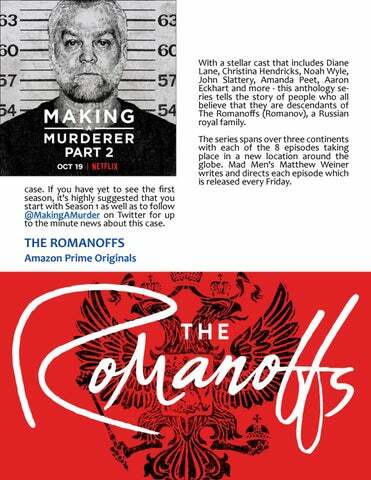 With a stellar cast that includes Diane Lane, Christina Hendricks, Noah Wyle, John Slattery, Amanda Peet, Aaron Eckhart and more - this anthology series tells the story of people who all believe that they are descendants of The Romanoffs (Romanov), a Russian royal family. The series spans over three continents with each of the 8 episodes taking place in a new location around the globe. Mad Men's Matthew Weiner writes and directs each episode which is released every Friday. case. If you have yet to see the first season, it's highly suggested that you start with Season 1 as well as to follow @MakingAMurder on Twitter for up to the minute news about this case.